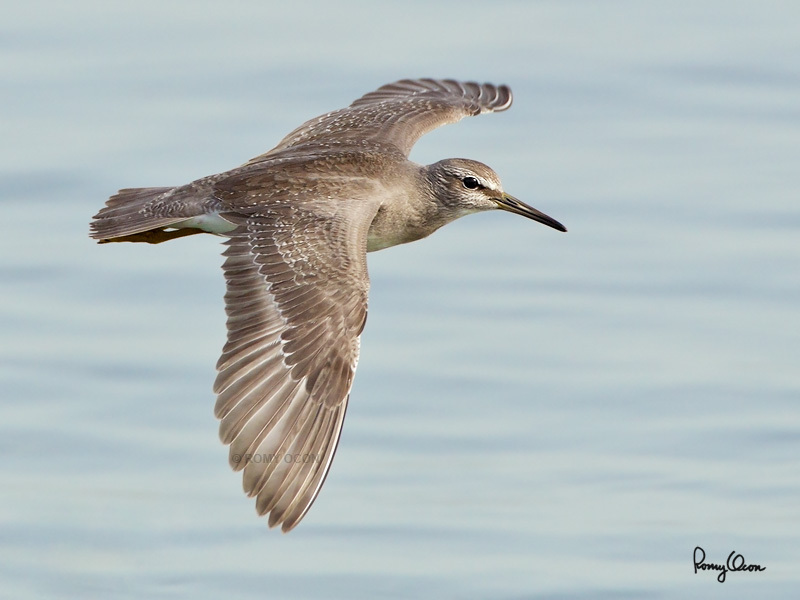 A common migratory waterbird, the Grey-tailed Tattler flies low over the water when flushed or when transferring from one feeding spot to another. It’s medium sized, with a total length of 250 mm. Its neutral plumage moving fast against a background of contrasty water surface is an autofocus nightmare even for the best DSLRs on the planet. Acquiring and tracking a white egret in flight against the busiest and contrastiest background are child’s play in comparison. One has to pan well and maintain focus lock by keeping the AF bead on the fast flying bird at all times during shooting. Otherwise, the focus can easily jump to the shimmering water surface. I have a very small percentage of sharp shots of this species in the air, specially if it’s flying low and there’s a very short distance separating the bird and the water surface. This instance was among the few ones when my panning worked decently enough, resulting to a sharp capture. Habitat – Along coast on exposed mud, sand and coral flats, on rocks, and also ricefields. Shooting Info – Coastal Lagoon, Manila Bay, Philippines, September 20, 2010, 1D MIV + EF 500 f4 L IS + Canon 1.4x TC II, 700 mm, f/7.1, ISO 400, 1/1600 sec, manual exposure in available light, 475B/3421 support. Click here for some footage of this bird feeding along the shore of Manila Bay.